Being Better off is Still Not Being Equal; that is what is happening in Selma in 2015. Imagine: "It took over 35 years to dislodge Joseph T. Smitherman, who was mayor of Selma on March 7, 1965, the day known as Bloody Sunday, when lawmen disrupted the first attempted Selma-to-Montgomery march, brutally attacking peaceful demonstrators." "Some progress has been made in the justice system, though real justice remains far removed. The Selma mayor and police chief are African-American, and Dallas County has an African-American district attorney. But black men are often held in jail for extended periods on multimillion dollar bonds, and police brutality and profiling of the poor remain far too prevalent." Please read the complete article in the NY Times linked below. SELMA, Ala. — The memory is as powerful as if it were yesterday. 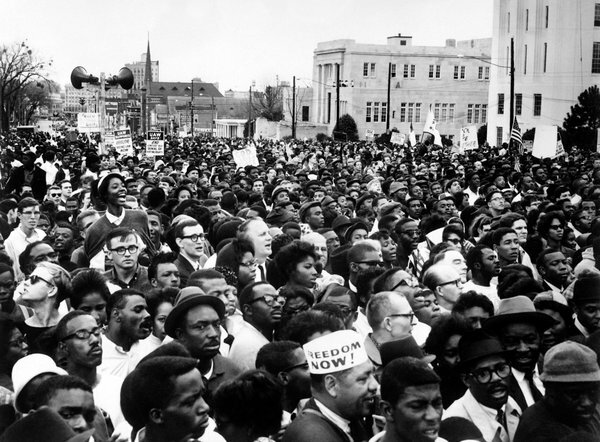 On March 25, 1965, tens of thousands of us gathered before the Alabama State Capitol, the endpoint of a five-day, 54-mile march from Selma to Montgomery. Dr. Martin Luther King Jr. called out, “How long?” and the crowd responded, “Not long!” The moment was electric. We believed it would not be long before the right to vote was deeply rooted and bearing fruit in America. In one sense, we were right. The Voting Rights Act, passed just months after the Selma marches, banned the discriminatory voting practices that many southern states had enacted following the Civil War. Over time, the Act enabled millions of African-Americans to register to vote, and for decades following its passage, voting rights continued to slowly expand. But in another sense we are still waiting. Either Dr. King was wrong or “not long” is biblical, measured in generations. We came to Selma in 1971, newly married and fresh out of Harvard Law School. Our intentions were to stay for five years. We were sure that by then Dr. King’s vision of voting rights would have been realized. Over 40 years later, not only are the fruits scarce, but the roots are shallow and feeble. Celebrations, commemorations and movies make people feel good, but the reality is that voting rights have been rolled back dramatically in recent years. The Supreme Court’s 2013 ruling in Shelby County v. Holder effectively gutted the Voting Rights Act, striking down a central provision requiring certain states, including Alabama, to obtain federal clearance before changing voting procedures. Since then, several states have limited access to voting by blacks and others. Today, all Alabama voters must show photo identification. In Alabama and other states, this I.D. must be government-issued. These policies, which disproportionately affect minority, poor and elderly voters who are less likely to possess government-issued I.D.s, are the 21st-century equivalent of the Jim Crow-era poll tax and literacy test. Dr. King understood that voting would be the last right granted to African-Americans because it was the most powerful. Indeed, if we had better understood our history, we would not have been surprised that “not long” has stretched into a half-century. We did not remember that, though the 15th Amendment gave black men the right to vote in 1870, Congress in 1894 repealed legislation enacted in 1870 and 1871 that provided robust and necessary enforcements of that right. In a sense, in 1965 we were trying to get back to where we briefly were in America in the 1870s. "Despite our city’s fame as a cornerstone of the Civil Rights movement, (in 2015) African-Americans in Selma who dare to discuss these issues openly and honestly are called racists, haters and worse." OneWorld Progressive Institute, Inc., is a small group of committed volunteers who produce community information and education television programs on health literacy, education and civic engagement. We also find good information and post informative blogs about issues we believe shine light and are beneficial to many in our communities. Learn more about us at our web site: www.oneworldpi.org/ and visit our Civic Engagement section at: http://www.oneworldpi.org/civic_engagement/index.html We are about Civic Engagement & Public Good, and we strive to make positive contributions to our community.